We all know it's easier to remember faces than names - recognizing a former colleague after many years but unable to remember his or her name. And we often identify a movie after only a few seconds while someone explaining the plot leaves us completely blank. 90% of data coming into our brains is visual (Hyerle, 2000) and we can process that data up to 60,000 times faster than verbal information (3M Corp.). Visual and verbal information actually activate different parts of the brain, according to recent neural research. Visual information engages many more associations already memorized in different areas of the brain, so new visual information is more likely to “stick”. Why our brains are so well adapted to visual information, compared to written, is not difficult to understand. A hunter who reads a book to identify an animal is more likely to be prey than predator! However, in the context of work - any work (getting things done) - visual alone is not enough. Imagine a PowerPoint presentation without any words. The audience would be baffled, at best, and likely misunderstand what the author was trying to communicate. How Well Do We Recall Information? *Visual Language and Converging Technologies in the Next 10-15 Years (and Beyond), 2001. The idea that images combined with text are much more useful and powerful than either images or text alone is the guiding principle of the Marine Diesel Basics series. From my own experience, I know that once I've seen something I can probably figure things out, with a little textual help. But if I'm not familiar with a piece of equipment, then no amount of written information can adequately explain the process or what needs to be done. 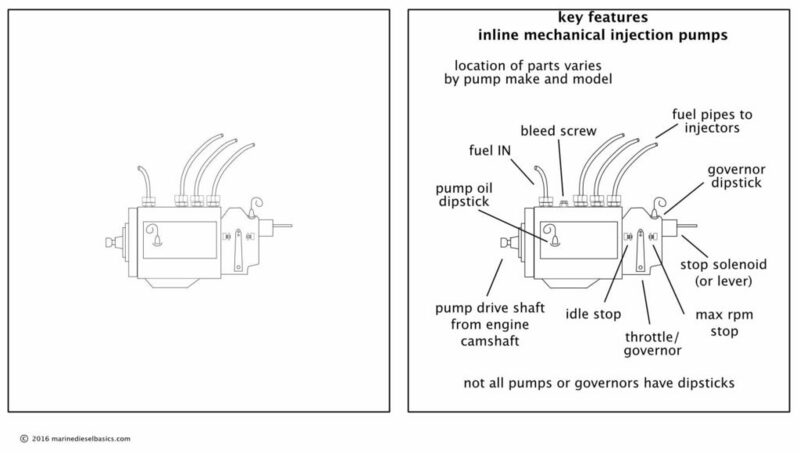 "An injection pump is a device that supplies fuel under pressure to the injector of a fuel injection system. ... The basic diesel injection system consists of injection pump, injection lines, injectors, and glow plugs."